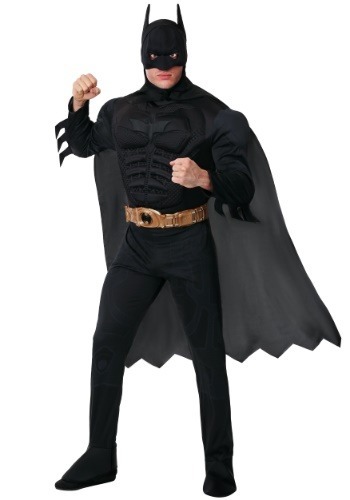 Adult Deluxe Dark Knight Batman Costume By: Rubies Costume Co. Inc for the 2015 Costume season. The process of becoming a superhero is pretty rough. First, something traumatic has to happen to you, like having your parents taken from you before your very eyes. Then, you have to be consumed by a desire to avenge them and enact justice for all crime throughout the land. Then, you'll have to seek out someone to train you and after all that, you'll still have to fight villainous wackos who dress up in themed costumes. Hopefully none of those things have happened to you, and you can simply get yourself our costume and call yourself Batman for a night. Better for the mind, as well as the wallet!